Two posts ago, I looked at Kenneth Branagh’s St. Crispin’s Day speech in the film Henry V. That speech — particularly the line “We few, we happy few, we band of brothers” — was the inspiration for the title of a book and the subsequent television mini-series that it spawned: Band of Brothers. 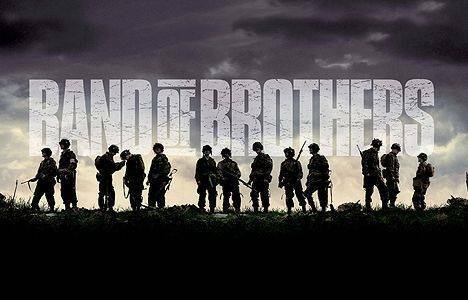 The mini-series was based on the real-life World War II experiences of E Company (“Easy Company”) of the 2nd Battalion, 506th Parachute Infantry Regiment assigned to the 101st Airborne Division of the U.S. Army. It followed the men of E Company from their training to Normandy to Germany and the end of the war. The series had many poignant moments, but one of the most moving was the speech below by a German General to his defeated troops. It was a speech that resonated not only with the German soldiers but also with the American soldiers listening. The German General eloquently conveyed in a few words the sentiments shared by all who fought, regardless of the uniform that they wore. As difficult as it must have been, the General kept his composure. If good speeches are needed in good times — and they are — they are critical in difficult times, when people are hurting and need to hear words of encouragement and hope. In such times, it is incumbent on speakers to remain poised and to demonstrate leadership, even when they are burdened with the same challenges as the audience. The General acknowledged the suffering and hardship that the men endured. He didn’t attempt to soften it. When delivering difficult news, it is almost always better to be upfront with one’s audience. He spoke in a loud and clear voice. He spoke with genuine emotion. He paused frequently (even if the pauses had to be extended somewhat to allow for translation into English for viewers). He maintained constant eye contact with his troops. The speech was entirely about the men. In fact, the General referred to himself only once — to say how proud he was to have served with his soldiers. The General concluded on a hopeful note, wishing his men long, happy and peaceful lives. This entry was posted in Speeches from Film and tagged 101st Airborne Division, 506th Infantry Regiment (United States), Band of Brothers, Band of Brothers (TV miniseries), E Company 506th Infantry Regiment (United States), eye contact, Henry V, Henry V (play), Kenneth Branagh, public speaking, speaking with passion, St. Crispin's Day, Voice Projection. Bookmark the permalink. I can recall the exact moment I first heard this speech. Although it was only television it instantly resonated something about the relationship between a caring commander and the soldiers that he served and his respect for them and vice versa. The fact that it was based on truth gives a lie to all the propaganda that is fed to us about the Nazis (admittedly nasty) and the Wehrmacht. Most soldiers are serving only their country, their regiment and comrades. A truly brilliant piece of television. Thanks for the comment, John. Nazism, as a political philosophy, is utterly repugnant. But there is no question that many Germans fought, as you say, for their country and comrades. This was a great scene. You can see the complete understanding of the American soldiers as they listen to the German General speak. At that moment, nationalities dissolve and they are all just soldiers. My grandfather wasnt one of these “Easy boys”, as he calls them; however he served in Dog company, 2nd battalion, 506th. Specifically a common infantry man he soon became the recon soldier. Once being wounded in Alla miene. And a second in the town of Cerentan. I asked him about it once. He told me an officer of the Reich spoke to his men, however in a less formal fashion due to the speech being given in a concentration camp railstation as the nazis were then taken to southern france. Thanks very much for sharing your grandfather’s story with us, Michael. And thanks also for the insight into the speech. They often make things more dramatic for film, but I can well imagine that there was some drama in reality as well. I thought the German General scene was great. Was this portraying a real happening? If so – who was the actor representing? You are right, the fact depicted is real, and is told in Stephen Ambrose’s book. Although a general is put on the film, it is rather a colonel that is credited for this speech, on Lipton’s account of the facts. And he tells about the speech in the passive form, so the exact words we do not know. I have made a transcript of the speech, because it has touched me deeply. But the series director (Tom Hanks in this episode, I think) has made a very good job in conveying all the emotion of such an event! By the way, I liked a lot your page John, keep up the excelent job! Thank you for the comment, Julio and for all the additional information. I think that scene is incredibly important for the very point you raise: the soldiers on the other side were people too who had fought for their country, lost friends, were scared and would have rather been home with their families. It is a very poignant scene. Thanks also for the kind words about the blog.